In an anteroom of the clothing cabinet, the courtiers await the appearance of the Emperor. 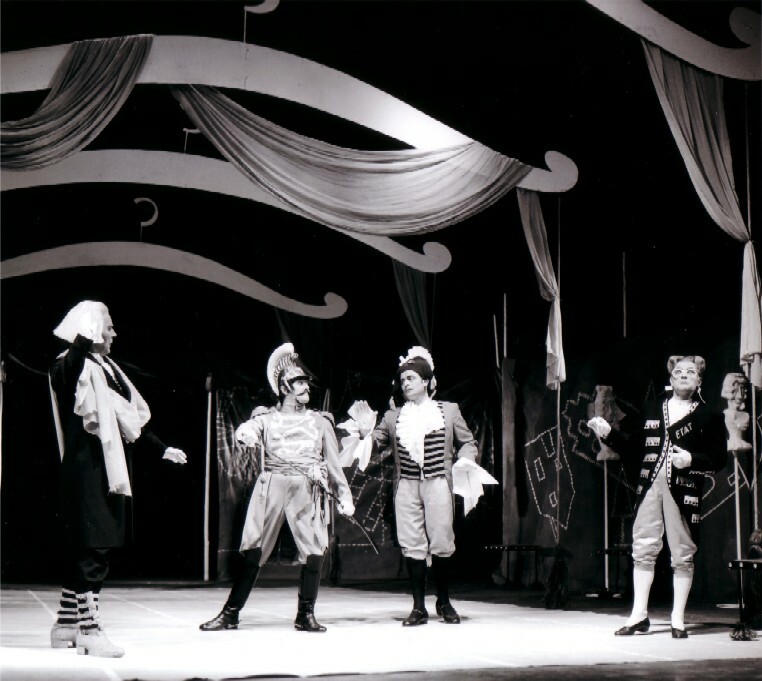 In a terzetto, the General, the Finance Minister and the Theatre Director complain of their forced idleness and the neglect of the affairs of state, which are as a result of the Emperor's obsession with clothes very close to ruin. 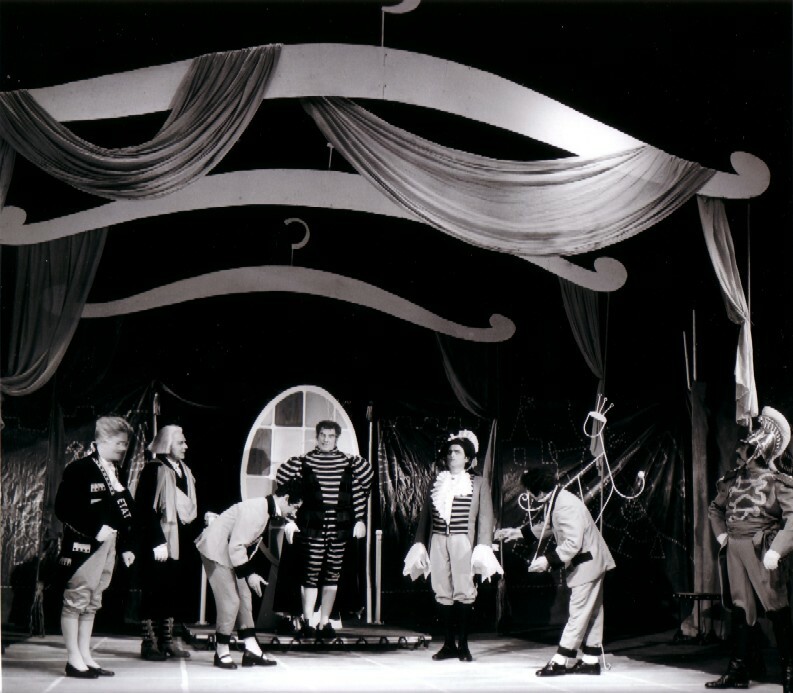 The Lord Chamberlain enters and tells of two men who have turned up at court and promised to make the Emperor clothes more beautiful than any ever seen before. These clothes have in addition a very remarkable property: for anyone who is unforgivably stupid or unfit for his office, they remain invisible! Christian and Jacques in private. The two miraculous tailors admit frankly their "craft of air and blue vapour" and make jokes over the credulity of the court. The music parodies modern dance rhythms and represents at the same time the working of the imaginary looms on which, out of the materials of human vanity and curiosity, the "Emperor's new clothes" are created. When the Lord Chamberlain appears, a scene of ironic reverence develops. Christian and Jacques willingly display their "magnificent fabrics" and surpass each other in praising them to the courtier. The shock of the Chamberlain is rapidly transformed into hypocritical and forceful admiration. 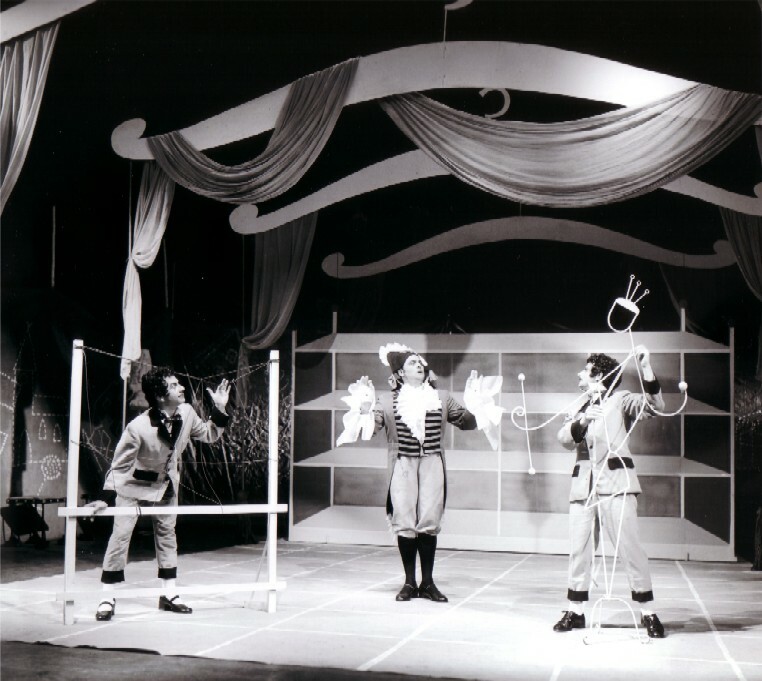 The reliance of the miraculous tailors on human weakness is rewarded, in triumph Christian and Jacques sing mocking songs after the departing Chamberlain. Curiosity brings the people together in front of the Emperor's palace, where behind a window the shadows of Christian and Jacques are to be seen. A servant announces the approach of the Emperor, who, dressed in exaggerated magnificence, attracts the attention of the people. The Emperor is surprised at the crowds before his palace so late in the evening. Discovering the reason, he promises the people a triumphal procession for the next day, in which he will display the wonderful new clothes. Emperor and attendants in the throne-room in nervous anticipation of the great moment. Christian and Jacques frisk into the room, carrying the Emperor's "new clothes" on their arms. Confusion overcomes the company: where then are the new clothes? For the third time, a transformation from critical soberness to euphoric hypocrisy takes place. Emperor and courtiers outdo each other with exclamations of ecstatic enthusiasm, at the climax of which Christian and Jacques, in a solemn Arioso, are named court tailors and weavers and receive rich rewards. With jubilation, the people acclaim the triumphal procession of the Emperor. Strutting in with great dignity under the baldachin, the Emperor receives the ovations, proud and touched. All voices unite in spirited jubilation. But here events take a new turn: a child's simple conclusion that the Emperor does not have any clothes on at all causes the veil of hypocrisy and self-deceit to tear and opens the doors for outpourings of mockery upon the conceit of the clothes-mad monarch. The Emperor, awaking out of his fantasy, declares himself to be at fault. He is prepared to take the public humiliation upon himself without mitigation. But now the child speaks for the second time and awakes in the crowd a sense of their share of the blame. The lie is exposed. With renewed shouts of loyalty, the people gather protectively round the Emperor. In the closing fugue, a conclusion is drawn, deliberately moralising and thus coming close to dissolving everything into irony: let every man beat his own breast. Above the derision and laughter, a conciliatory perspective is opened upon the weakness that all mankind shares in common. The 31 year-old Genzmer pupil Bertold Hummel has joined the individual scenes together in strict musical forms. The instrumentation underlines the grotesque in each situation, without however being confined to pure illustration. The composer scored, besides soloists and chorus, for a modest chamber orchestra, - four woodwind, a trumpet, three violas, two cellos, a double bass and piano, complemented by copious percussion requiring two players. "A musical setting for the Emperor's new clothes"
World première of a chamber opera by Bertold Hummel in Freiburg. The chronically embarrassing repertoire of light-hearted works for the German operatic stage has now gained after the "Revisor" by Werner Egk a new opportunity in Freiburg: in the Großes Haus, "The Emperor's New Clothes", a chamber opera by the 31 year-old Genzmer pupil Bertold Hummel receives its première . 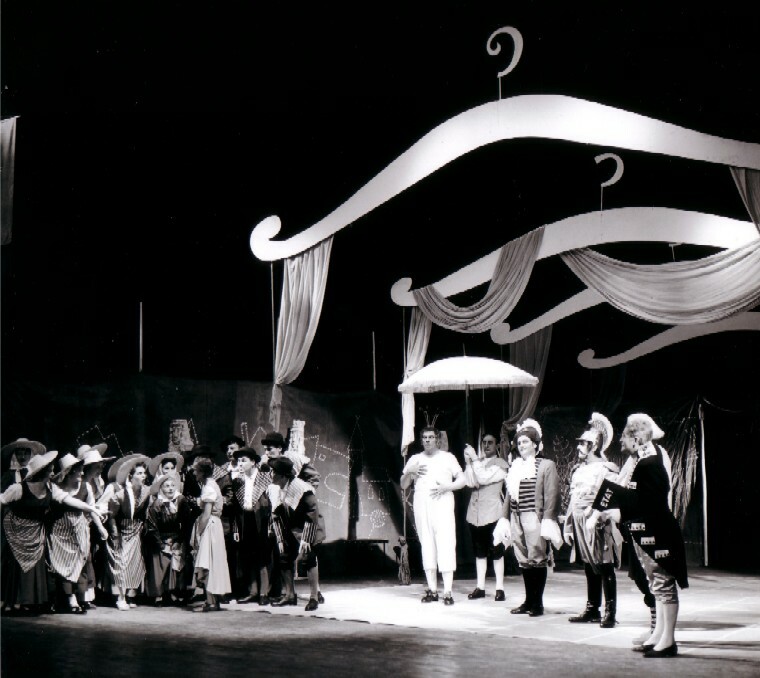 The Libretto by Oskar Gitzinger renders Hans Christian Andersen's satirical fairy-tale in a rapid scenic sequence, portraying the Emperor befogged in his self-conceit and eventually, the victim of two charlatans, strutting in, amidst the jubilation of his blindly credulous subjects, dressed in underpants. Only the ingenuous words of a child manage to expose the rather naked truth. Emperor and subjects admit their self-deceit and confess jointly their guilt. Bertold Hummel has risked the leap from the field of church music into the milieu of these light-hearted, moralising yarn-spinners and swindlers. He has brought the individual scenes together in strict musical forms and accompanied the burlesque developments with a chamber orchestra of four woodwinds, a trumpet, three violas, two cellos, a double bass, piano and copious percussion with partly illustrative, partly contrapuntal music. Despite the demands made on soloists and chorus, his music is easy to listen to, although the instrumentation occasionally showed gaps. 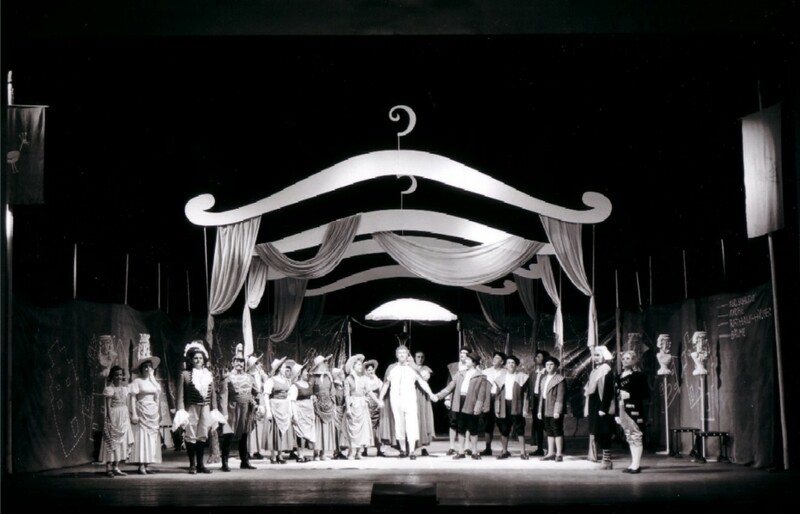 The world première in Freiburg under the musical direction of Günther Wich was staged by Reinhard Lehmann with particularly charming scenery by Renate Riß, crowned with elegantly curved clothes-hangers. The Emperor was sung by Carl Schlottmann. The entertaining little work was given a friendly welcome by the audience.